I encountered this issue while writing my article series on Patching Hyper-V Hosts with SCVMM 2012. As a reminder, my Hyper-V Host is NOT a member of my Lab domain. Therefore, it is added to SCVMM as a Perimeter Host. At first, I was actually encountering the following error. Compliance scan failed with error: 8024402c. After laboring over many Google search results, and not coming to a solution, something struck me. The Recommended Action states in part “Ensure the WinHTTP proxy settings are correctly configured for the communication with WSUS.” This got me thinking, “what’s wrong with the communication?” After all, I can successfully PING my Host server from inside the SCVMM virtual machine. So it made me question the communication/connection from my Host to the SCVMM virtual machine. And that’s when I checked my Host’s network configuration, and discovered that my Host’s Network Connections to my Hyper-V Virtual Switch was disabled. I don’t recall when/why I disabled it, but I re-enabled the Network Connection. After re-enabling the Host’s connection to my Lab’s virtual network, I re-initiated the Compliance Scan. The result? ERROR! But, this time it was a different error. A Hardware Management error has occurred trying to contact server HOST . Check that WinRM is installed and running on server HOST. For more information use the command “winrm helpmsg hresult” and http://support.microsoft.com/kb/2742275 . Now we’re getting somewhere. When I Googled the error wording: “VMM A Hardware Management error has occurred trying to contact server”, I was lead to this site: SCVMM 2012 – A Hardware Management error has occurred trying to contact server. Unknown error (0x803381a6). I checked my Host’s WinRM configuration, and the service was already running. However, one of the comments pointed me to this site: How to troubleshoot the “Needs Attention” and “Not Responding” host status in System Center 2012 Virtual Machine Manager. In that Microsoft KB article, it was Step 5: Check the Svchost.exe process of the Windows Remote Management service, that ended up resolving my issue. This problem can occur if the shared Svchost.exe process that hosts the Windows Remote Management service is experiencing issues. 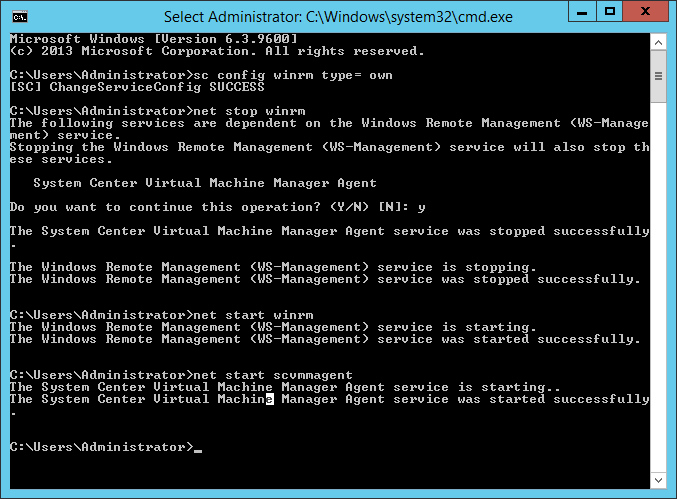 To resolve this problem, configure the Windows Remote Management service to run in a separate Svchost.exe process. To do this, open an elevated command prompt, type the following command and then press ENTER. Note Make sure that you type the command exactly as it appears here. Notice the space after the equal sign (=) symbol. Finally, after going through all of that, I went back to the SCVMM console, and again, re-initiated the Compliance Scan. The results? This time the scan completed successfully and the Compliance Status is shown! So that’s my experience in using my non-domain joined Hyper-V Host with SCVMM.